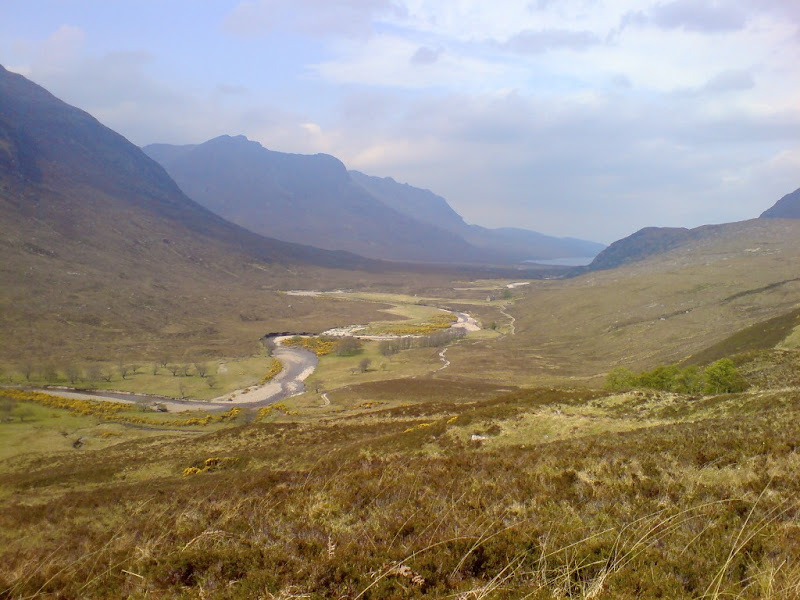 This is the second part of our walk on the Cape Wrath Trail. 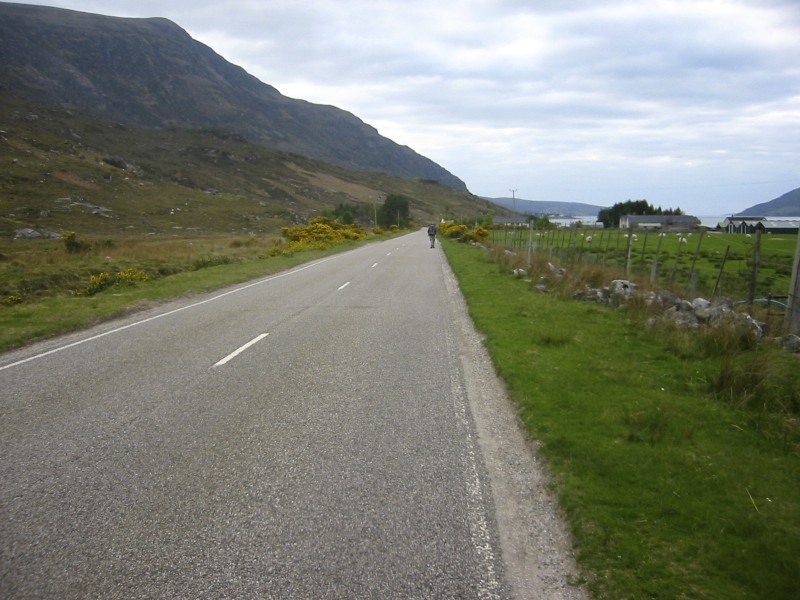 Having completed the section from Cape Wrath to Ullapool the previous year we had an obvious starting point. The problem was which way to go once we got to Morvich, after some discussion we elected to go to the youth hostel at Altbeithe and then to the Cluanie Inn and over via Glen Garry toward Fort William. We had been blessed by the weather the previous year but would not be so fortunate this time. 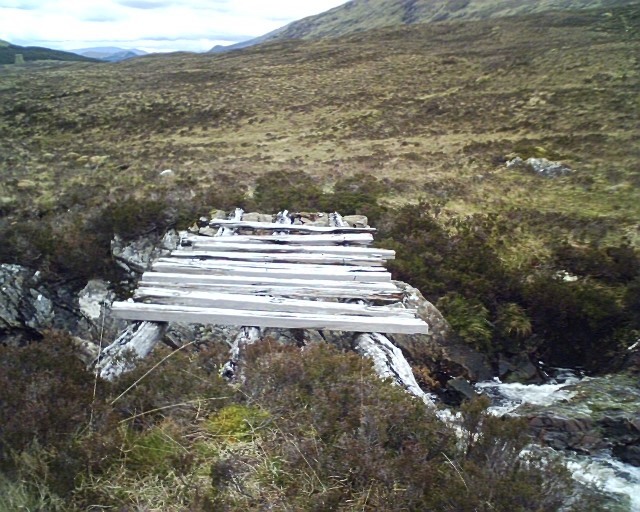 Having spent some time working on the route before undertaking this trip we knew one potential hazard was crossing the river Carron at Achnashellach station. There was no longer a bridge here and the detour was quite significant. 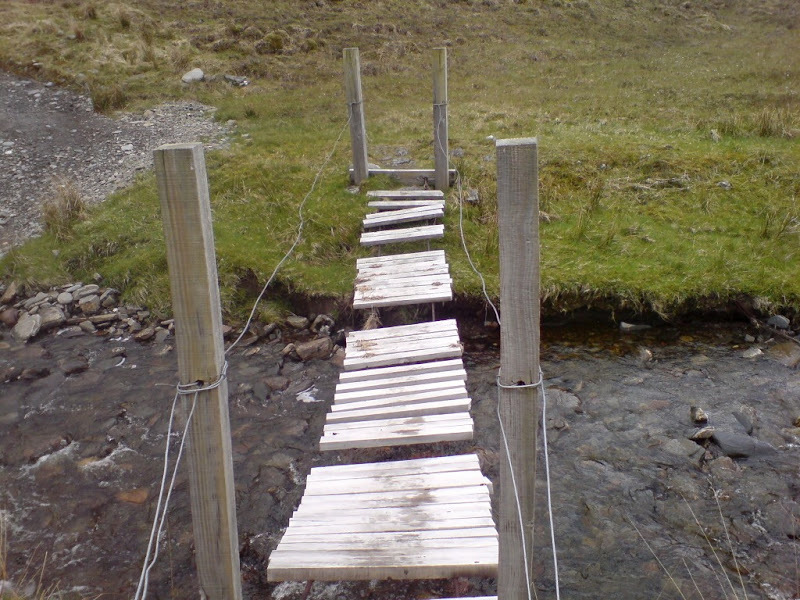 We had decided to risk a river crossing and given our previous every man for himself river crossings, we knew this one could not be tackled in the same manner. Having once more arrived at Inverness we met up with Ewen who ferried us up to our start point just below Ullapool at Crofttown near Inverbroom Bridge. The problems began almost immediately as we could not find the trail. The path is on the map but its not there. There is a plantation of pine trees obscuring it and sure enough on climbing up through the trees the path can be located on the other side. The weather was great and the walking was now fairly straightforward. This wasn’t going to be a long days walk and we were heading for the Dundonnell Hotel so we took our time and enjoyed the scenery. 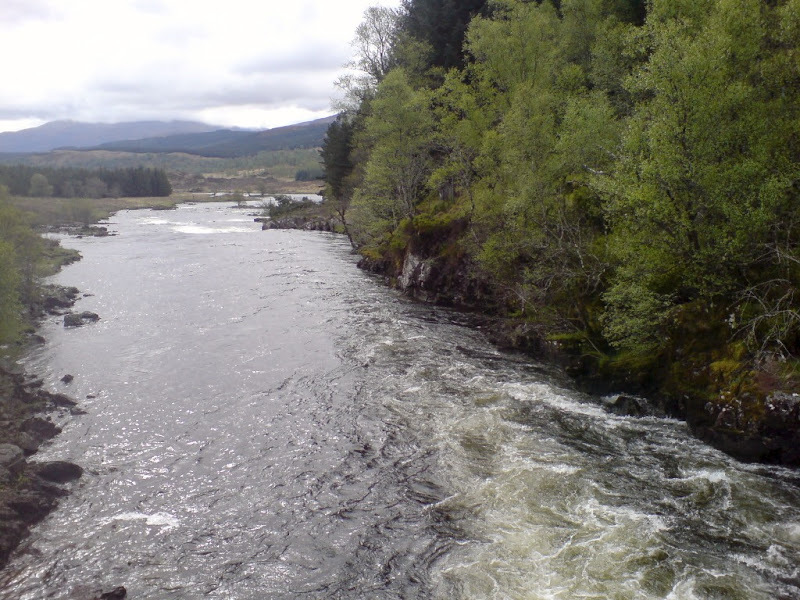 Following a couple stops we reached Dundonnell house and crossed the river where we picked up the main A832 road and hiked a fair distance to the hotel. We immediately resolved to bag a lift back up the same road to Corrie Hallie in the morning. In the morning sure enough Jim had secured a ride, for a small fee of course. On loading Jims pack into the car it felt suspiciously heavy, but hey he was carrying it not me. 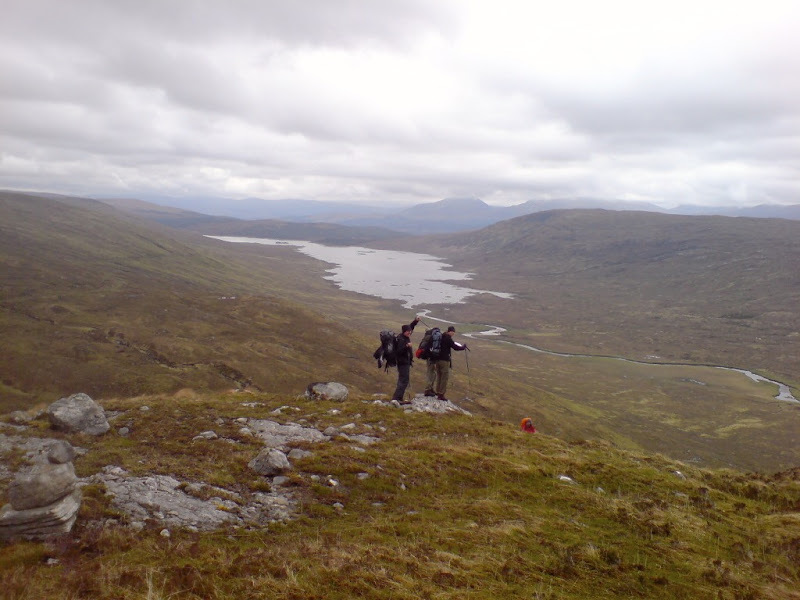 We had elected to walk from Corrie Hallie to the bealach na croise above Loch an Nid and camp there for the night. The weather was great and the view of An Teallach was awesome. Everything seemed to be going to plan, but a change in the weather was coming. We pitched camp in the bealach next to a burn. There clearly had been a dry spell as it was virtually empty. Having found some level ground we set up the tents. I saw Stuart deciding to pitch his on a nice level area slightly lower and very close to the empty burn. I suggested an alternative as it might be tempting fate if it rained. Fortunately he listened to this advice. By the time we had thought about making something to eat the weather was starting to turn, there was a bit of rain but nothing to get excited about. Jim broke out the inevitable bottle of single malt but was top trumped by Stuart who had bought a gift pack of six single malts. We all had a wee tasting but the three serious drinkers amongst us carried on and drank the lot. 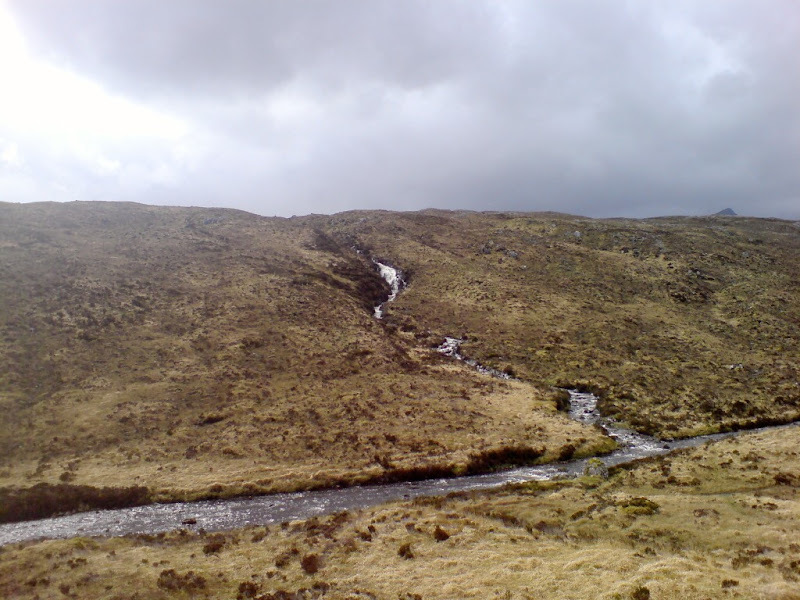 By this time the rain was really tipping down and the burn was now a raging torrent. Stuarts original camping spot was underwater. The larger bottle of single malt made a reappearance and you could see it would all end in tears. Stuart being the weakest of the three was the first to crack. Initially he became incoherent and was then unable to support his own body weight unaided. The conditions were pretty atrocious and soon he was flapping on the ground in his waterproofs like a demented seal. Being concerned about hypothermia Rob and myself dragged him into his tent and helped him get into his sleeping bag. The other two being much hardier carried on, but Simon when drunk cannot speak and has to gesticulate, Jim soon got bored of that and headed off to bed. That was not the end of it however. The burn was no longer rising at any great pace and it appeared our campsite would be safe from flooding. However the rain was still falling heavily and I was concerned about Jim and his tent. If you remember it was a £15 Argos special, recommended according to Jim by Cameron McNeish. I checked on him but he said it was fine (he was pretty pi**ed). The rain fell all night long and the wind picked up as well. I kept waking and hearing Jim moaning and cursing. I looked over to his tent several times; it was still there, just. I figured if he was moaning he was still alive, his bag was synthetic not down and it wasn’t that cold and I went back to sleep. I got up at first light; it was still raining although it was slowing up a bit. 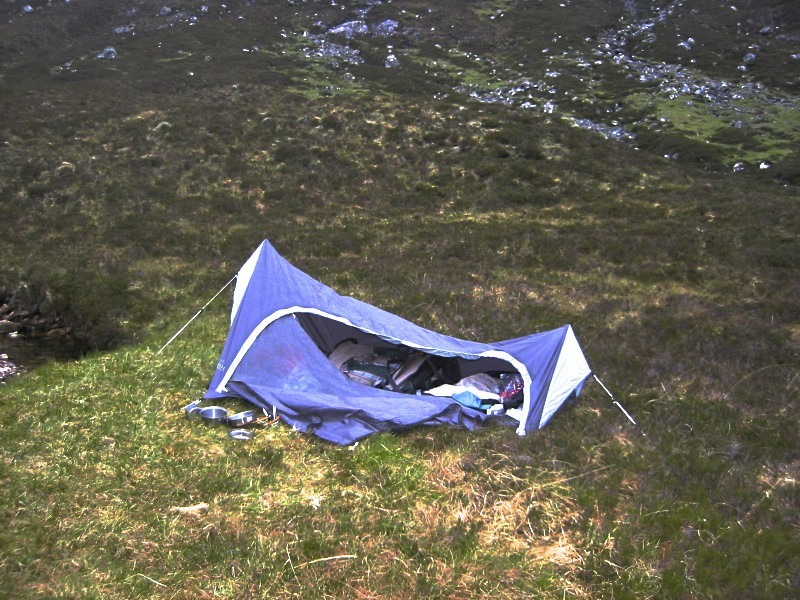 Everyone was still there, but Jims tent had completely malfunctioned. It had according to him first ceased to be remotely waterproof and had then collapsed. By far the majority of his gear was waterlogged, as indeed was he. I tried to get a brew on but it was so wet I couldn’t get the stove to light, the remaining wind wasn’t helping and it took me half an hour before I got the kettle boiled. Jims tent wasn’t the only casualty as my canon camera was completely soaked as well and packed up. My so-called waterproof gloves failed as had Rob’s waterproof trousers. 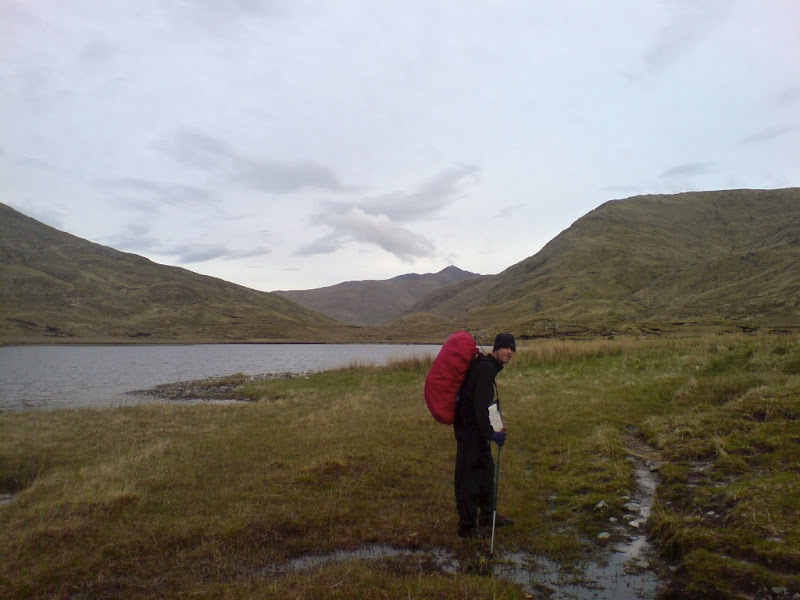 Heavy packs, no breakfast, pouring rain and nasty bogs meant it was a very tiring experience. We finally headed for some higher ground at Sithean Biorach to try and regroup. The problem was Jim was missing, we waited a while but he didn’t arrive and we couldn’t see him. I was worried; Rob dumped his kit and went looking for him. Twenty minutes of searching later and he spotted him; lucky for Jim he was wearing a red waterproof because he was a good half a mile away and heading in the wrong direction. Jim later said he didn’t know why he looked back in Rob’s direction as he was convinced he was going the right way but fortunately he did. Having returned to the group Jim was covered in mud. It transpired when we had become split up he had fallen into one of the bogs (grade one bogging) and couldn’t get out. We couldn’t hear him shouting and after the previous nights trauma and alcoholic excess he was well and truly stuck. He managed to free his waterbottle and being in charge of the energy bars he downed several and then tipped a sachet of lucozade powder into his bottle and drank the lot. He reckons this rush of sugar, coupled no doubt with fear gave him enough strength to haul himself out of the bog. We were all pretty shook up at this point. Finally and rather belatedly Rob and I got out the map (so that’s what they are for!) and took a bearing. We were of course in completely the wrong place. Having worked out the correct direction of travel we, as a group headed off. We stopped at the ruined sheilings at Loch Gleann na Muice and found enough shelter to finally get some hot food on board. 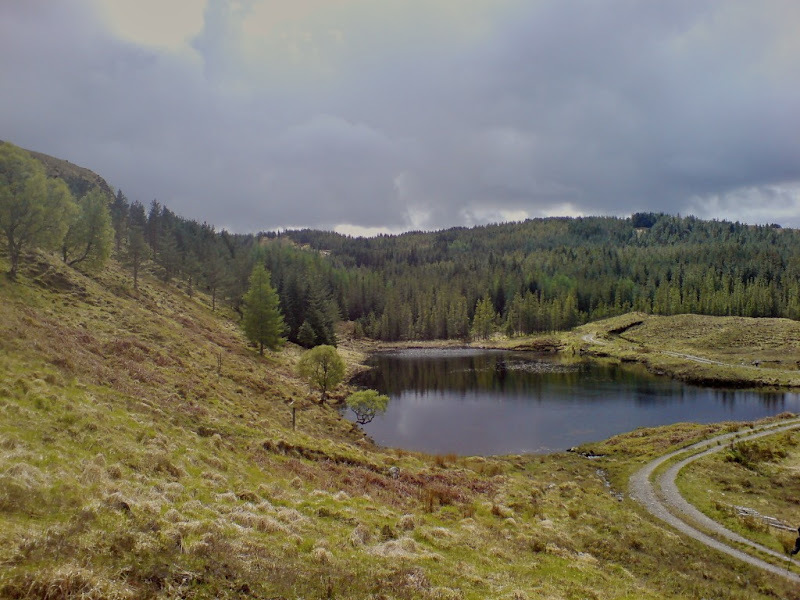 There is a photo of the ruin on geograph.org.uk under “Ruin above Loch Gleann na Muice”. Not taken by me as my camera was now totally dead. 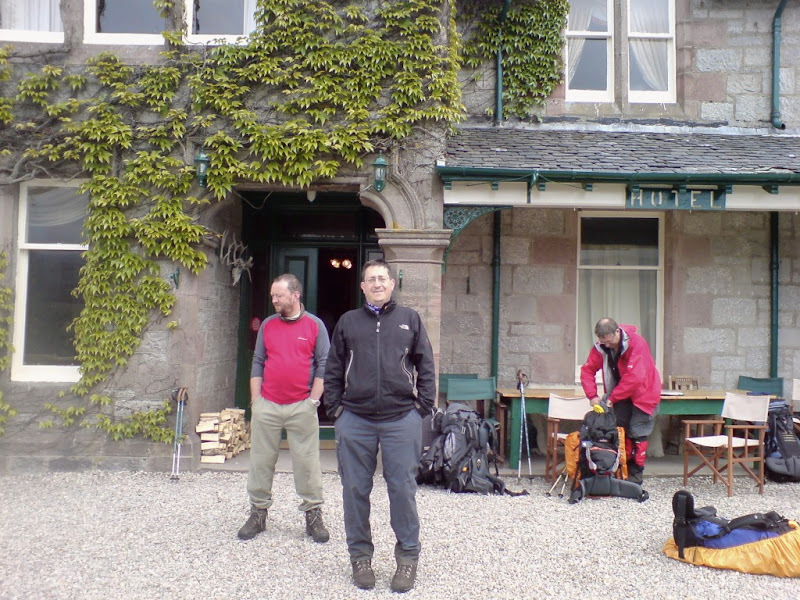 Much, much later we arrived at the Kinlochewe Hotel. Jims tent went straight in the bin and the rest of his and most of our gear into the drying room. I managed to replace my gloves at the local shop for a pair that really were waterproof. We also picked up a food parcel which we would need as we would be out in the wilds for the next three nights. That evening we reflected on the previous twenty-four hours. We had been careless to say the least. We resolved not to be so stupid again, a resolution that needless to say we didn’t keep. 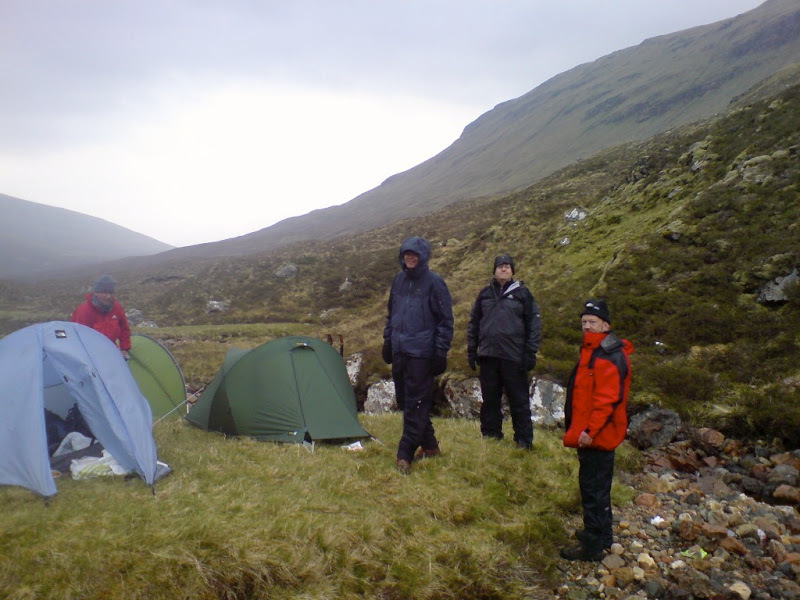 Having dried out and after a leisurely breakfast we set off heading for Bhearnais bothy. 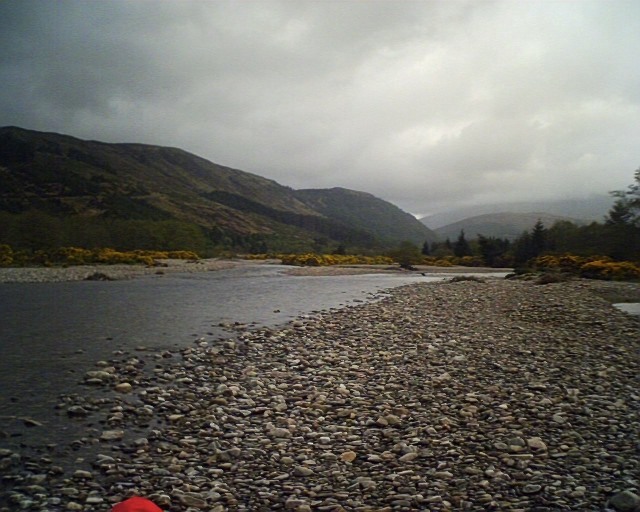 The attempted crossing of the river Carron above Loch Dughaill was on the cards for today and luckily the rain had pretty much stopped. Nevertheless we weren’t very optimistic about making it. 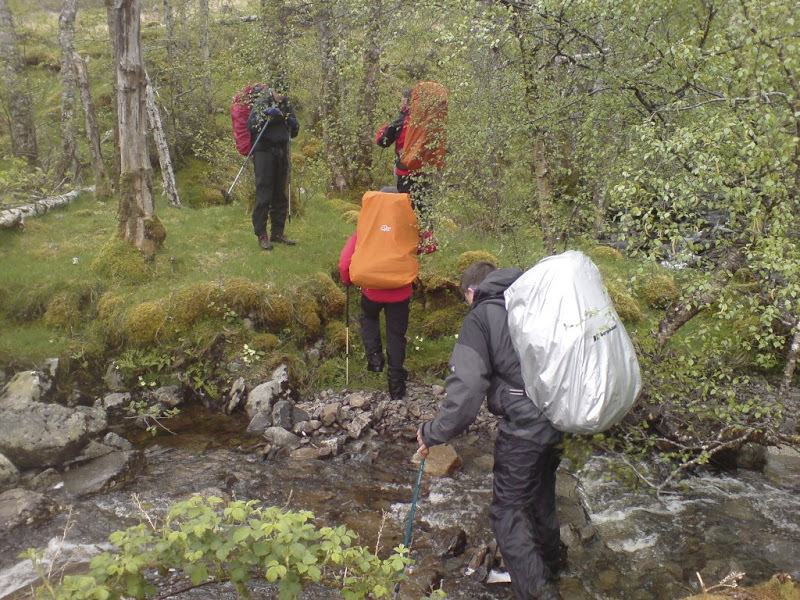 Things quickly deteriorated, we had followed the river out of Kinlochewe the A’Ghairbhe and had to cross several small tributaries. There were deer fences to negotiate and the route was not very clear. However much, much worse awaited when we reached the plantation just above Cromasaig . 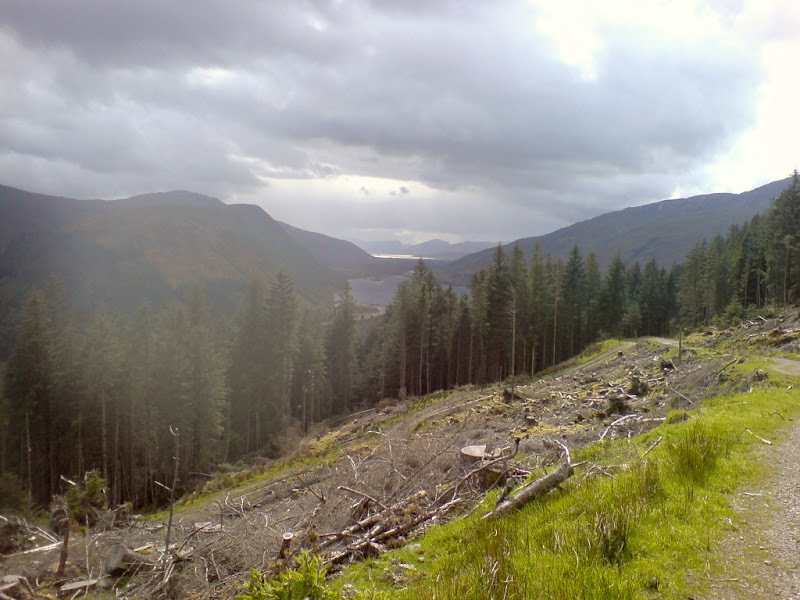 We already knew it had been ‘cleared’, in other words the trees were felled and the detritus was left to rot. 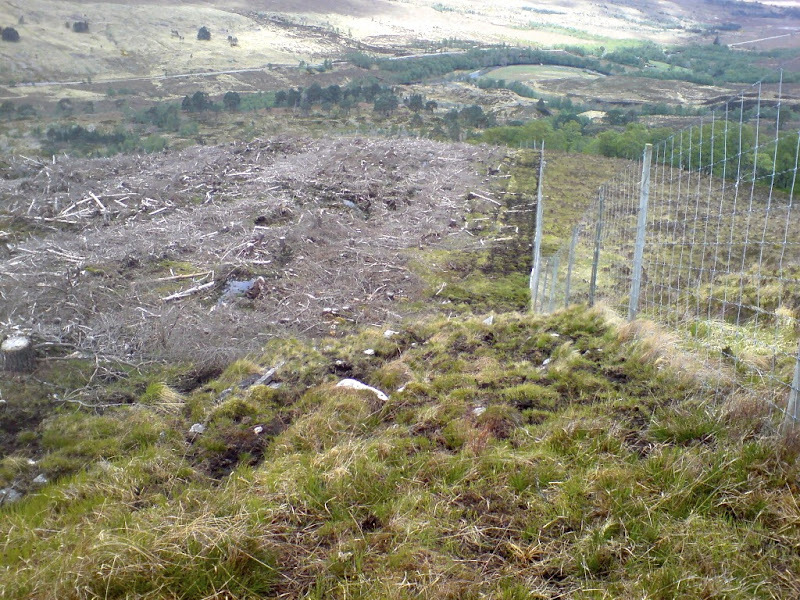 There was no path through this morass and the only route was up the deer fence. This was very, very boggy and littered with slippery bits of pine tree in various states of decay. It took two hours to climb what is now known as ‘Hamburger Hill’, just looking at the photo makes me shiver. 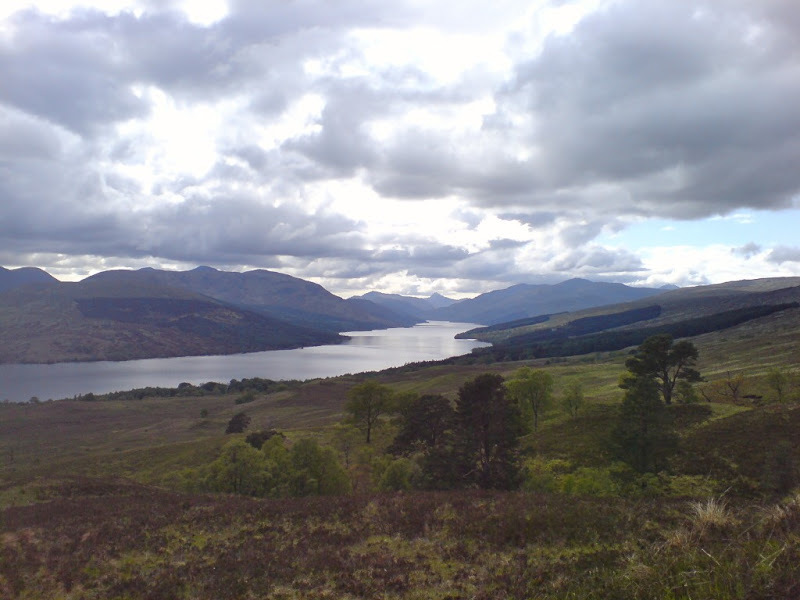 By the time we got to Loch Coulin and the lodge we were way behind schedule and decided to take the main Landover track down to Achnashellach station instead of the more scenic track down past Coir Lair. At the station Rob and Simon recced the river to see if we could get across. It seemed we could provided we picked the right spots to do so. I would not have liked to ford this river if it had been any higher. Most of the time it wasn’t even knee deep, but it had an incredibly strong current and one slip was all it would take to put you at risk. For once we did all look out for each other and all made it across without incident. I couldn’t find many photos of this area and took several with my lousy camera phone so others can at least see what its like. 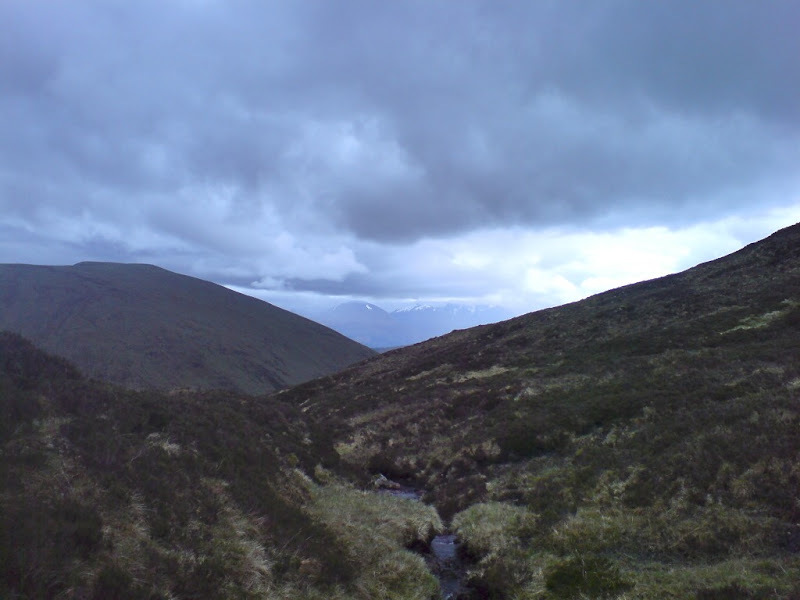 We now made our way up through Achnashellach forest to the top of Carn Mor and Aon Cheum. Once again we fell foul of the navigation curse. Having reached the top we could not see a path anywhere, nor did the terrain we could see fit the terrain that we were expecting to see. Because of this it is easy to become very disorientated, we kept looking at the map and at the scenery but it just didn’t fit. By now it was past eight and would be getting dark in a few hours. 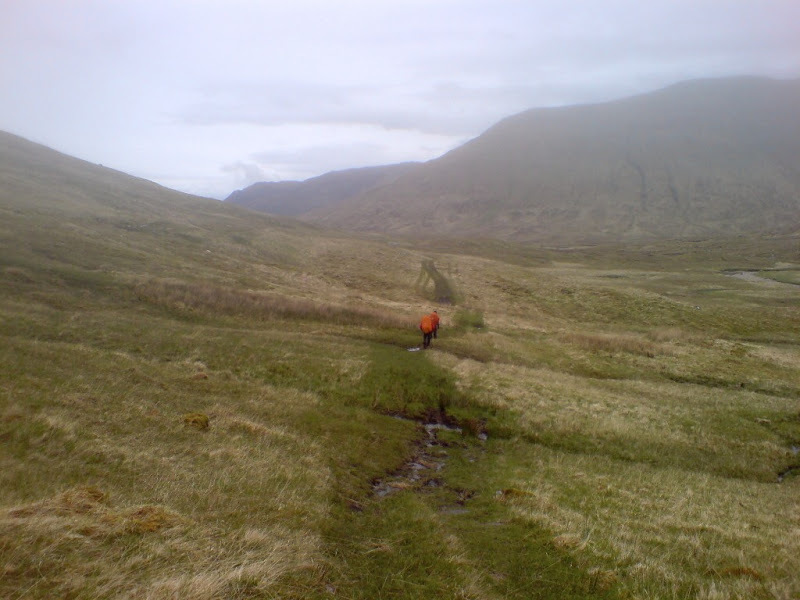 After half an hour of deliberation and expecting to pitch camp for the night the path suddenly revealed itself. It was straight up of course. What looked like a wall had a path running up it. Once at the top the route was clear and flat. We made our way to the bothy, someone was there as you could see a candle in the window from miles away. We surprised the occupants, but they were welcoming and Jim’s rucksack contained yet another bottle to ease things along. 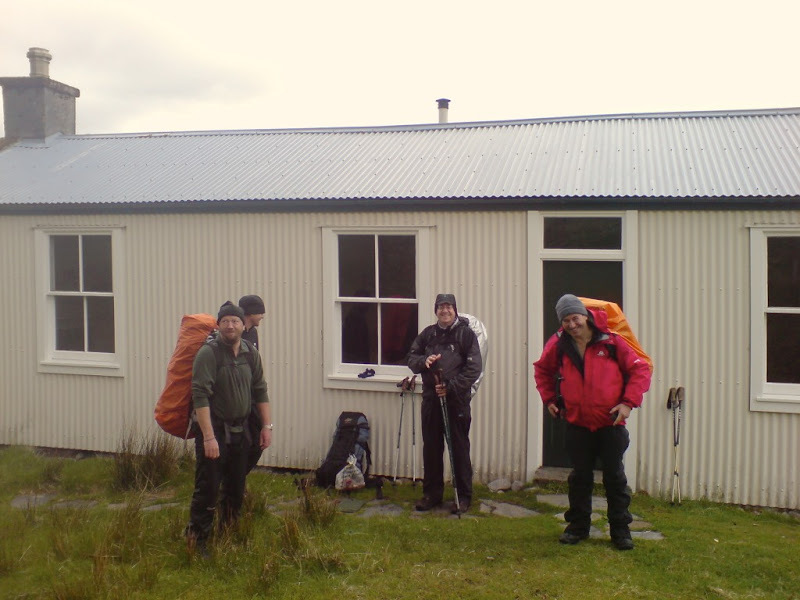 Simon, Rob and myself camped outside; Jim having no tent slept in the bothy as did Stuart but it was a bit cramped. In the morning it became apparent why Jim and Stuart had slept in the bothy. They both came out munching bacon sarnies. The rest of us don’t eat bacon, but were a little jealous. 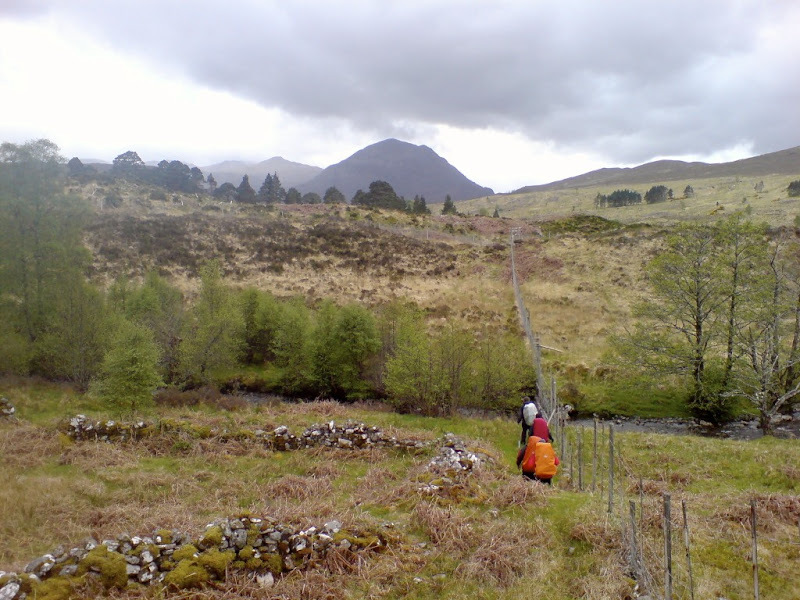 We yomped across the pathless area from the bothy crossing the abhainn bhearnais to reach the track towards Bendronaig Lodge or what is now known as ‘posh bothy’. We crossed the bridge where the track goes to Pait lodge. This track would be the scene of another near death experience for Jim when he flirted with hypothermia on what was a disastrous coast to coast walk. The same walk saw me in the Raigmore Hospital and Jim, Rob and Simon almost killing themselves (depending on who tells the tale ) on Ben Eighe (I have the photos to prove it), but that’s another story. 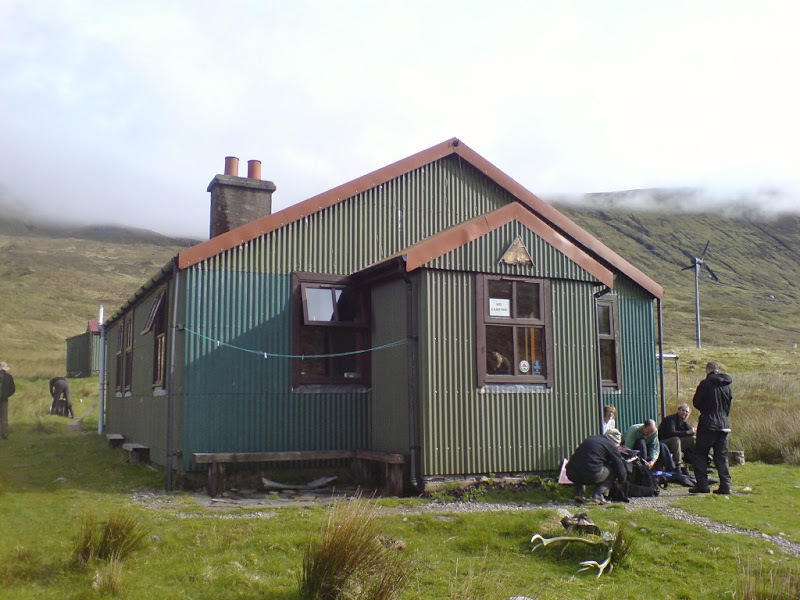 We reached Bendronaig lodge, which up until the previous night we had no knowledge of. 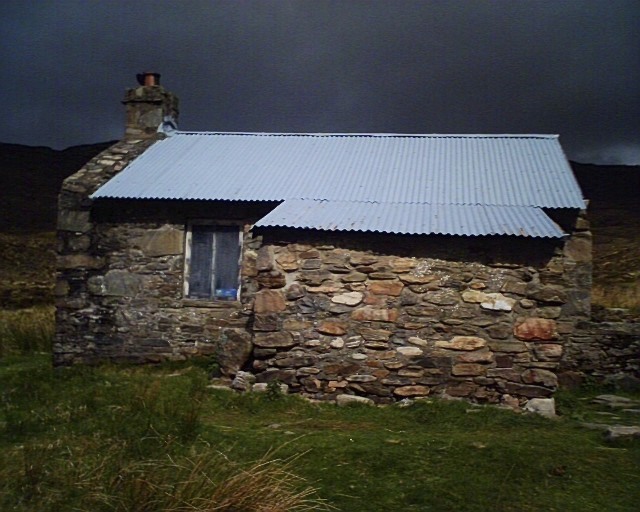 The reason for the visit is the flushable toilet no less, hence the name ‘posh bothy’. Jim was banned from using said facility until everyone else had done so and we were about to leave. We had a brew and tidied the place up in return for the use of the facilities. 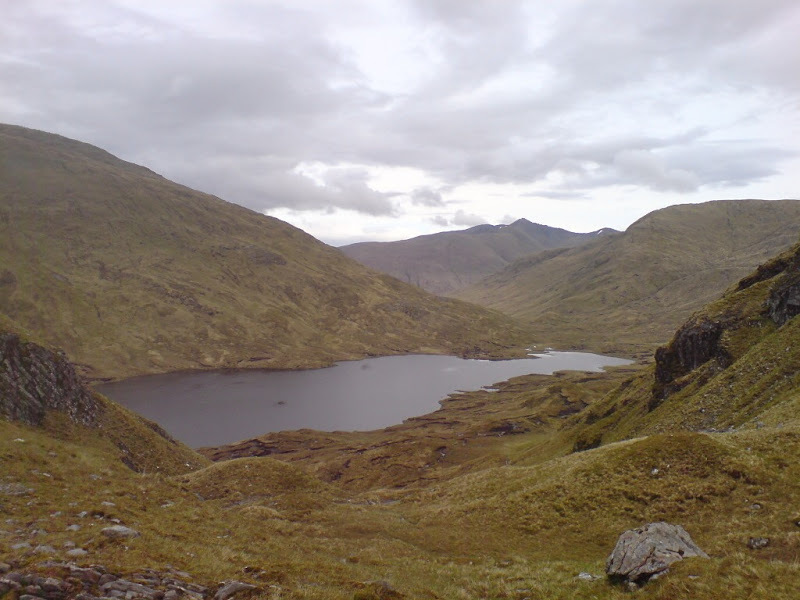 We pressed on towards Killilan following a good path down past the very picturesque loch an Droighinn. 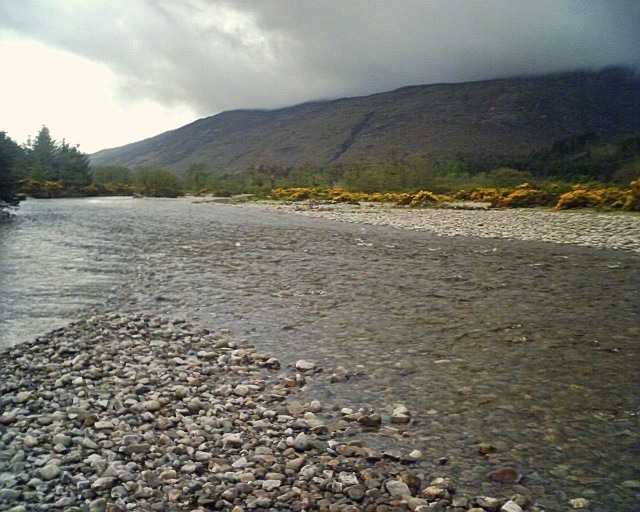 It became clear as we walked down the river Ling that we would not make it to our planned camp at the base of the climb to the falls of Glomach. We therefore pitched camp before Killilan. We met a couple of Salmon fishermen who were either staying at the Nonach Lodge or owned it. They were very posh but very friendly and invited us down for supper, an invitation we declined (not really dressed for the occasion). Everyone was getting a little tetchy by now, things weren’t helped by Stuart spilling some of his rather hot supper on me. 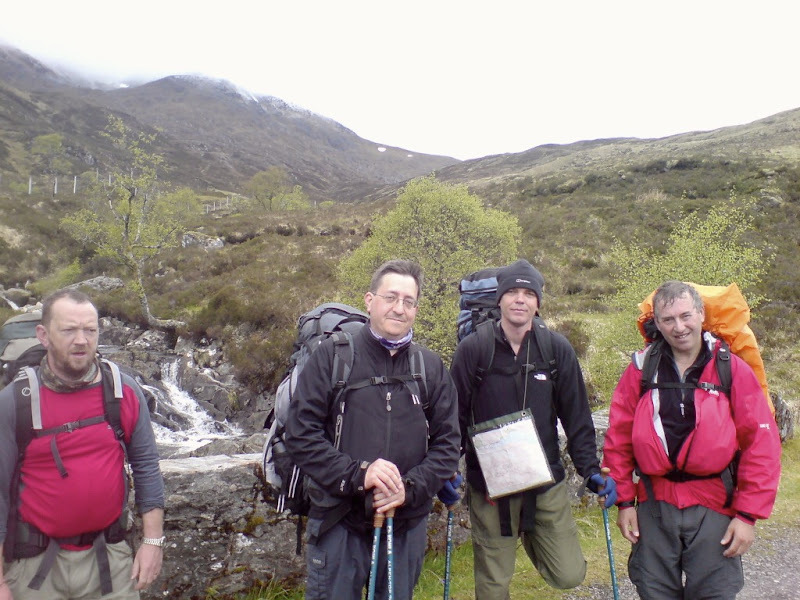 Jim was suffering alcohol withdrawal and Rob was getting irritated about the slow progress we were making. In fact only Simon remained as unflappable as ever. 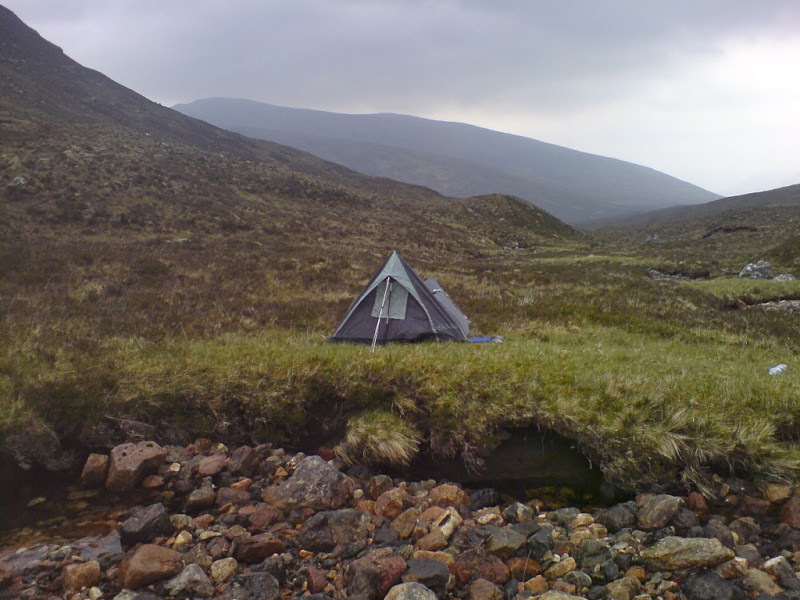 Things were not helped when the wind died and the midges attacked in vast numbers. Peeking out of the tent it was obvious the midges were waiting and in numbers. Jim was sharing with Simon, but both Simon and Stuart are not good at packing up quickly. Rob, Jim and myself packed in seconds, shouted to the others that we would see them in Killilan and legged it. The midges left us alone and we waited in Killilan a good hour before the others appeared moaning about having had no breakfast etc. Whilst we had been waiting we had consulted the map, it was a very long way to the youth hostel and we knew there would be rebellion. We wanted to get a partial rest day at the Cluanie Inn, so it was crucial to reach the youth hostel in order to do this. Killilan is an odd place it is incredibly neat and tidy. All the farm machinery was spotless and we saw them removing large boulders from the roadside in order to have a nice grass verge. What is that all about? 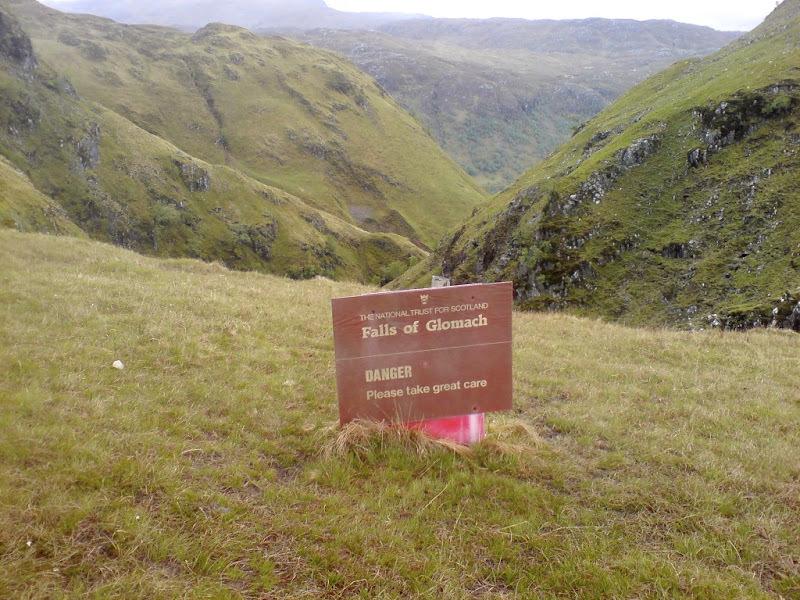 By the time we reached the path up to the falls of Glomach there were mutterings about the pace we were keeping. 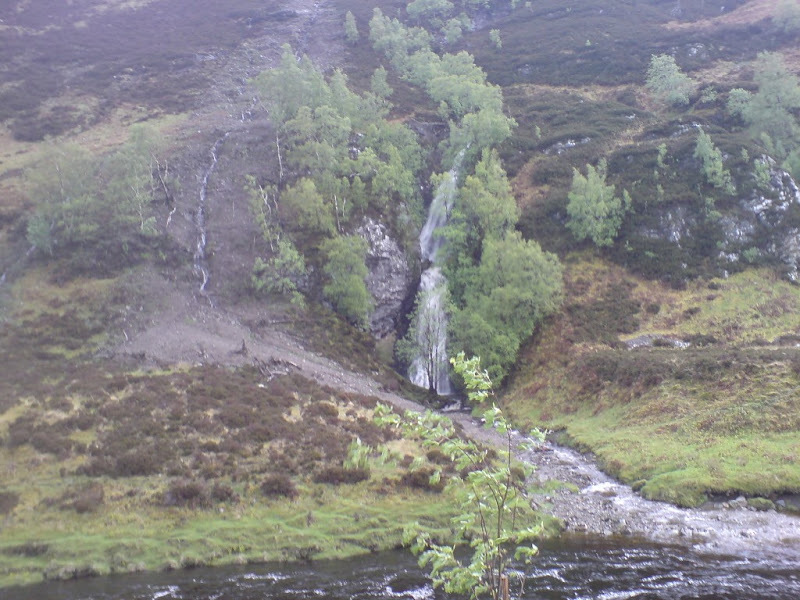 It’s a fairly hard slog up to the top but the interest is maintained by the falls themselves. Simon ignored the signs and went as close as he could to get some photos, this from someone who actually fell off a cliff in Cornwall having got too close to the edge. He was saved from serious injury by virtue of grabbing hold of a tree just over the edge, sort of thing you see in a cartoon. 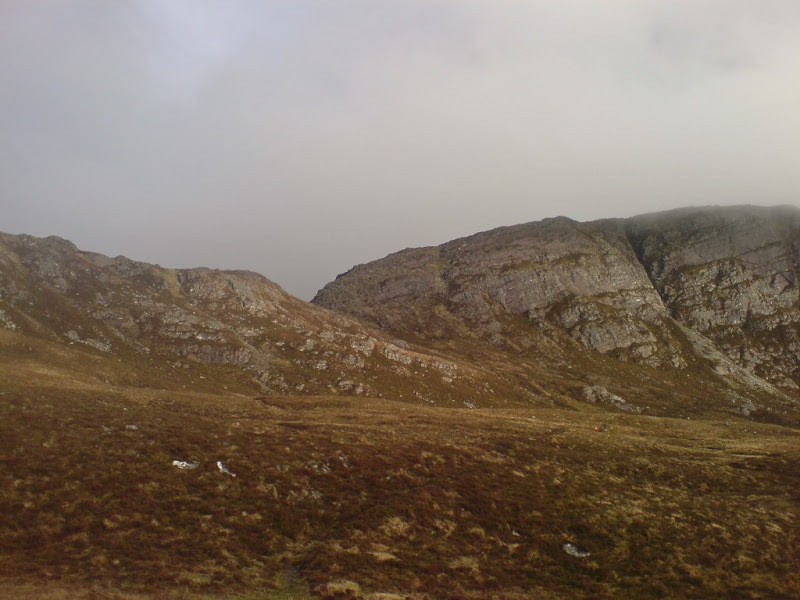 We now headed towards the woods at Dorusduain via the Bealach na Sroine, open rebellion was in the air. Stuart and Simon were talking about walking out to Morvich. Rob and myself knew we had to get to Altbeithe. By the time we entered what are now the ‘Woods of Woe’, Jim was muttering like Father Jack. Drink, feck, arse. Rob asked him for an energy bar and he literally blew a fuse. A full-scale argument ensued which certainly cleared the air. 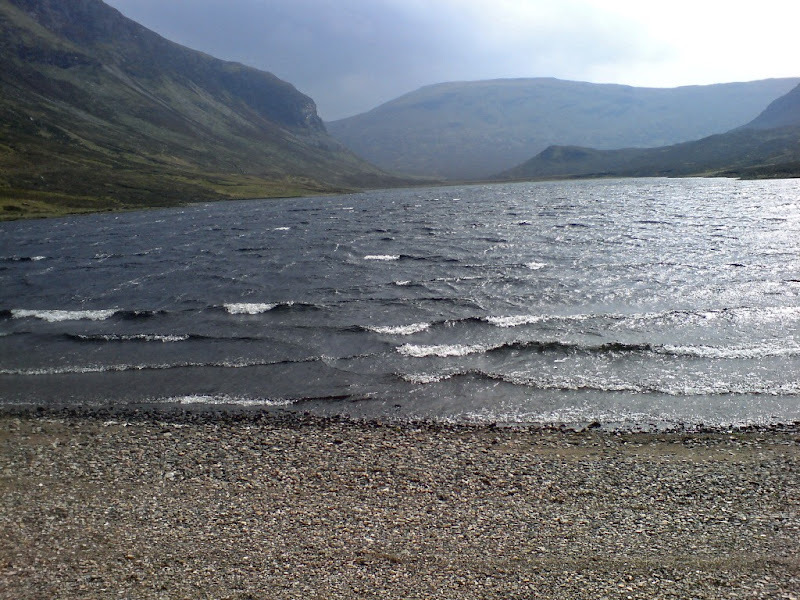 Rob and myself promised to compromise and stop at the Loch a Bhealaich, just beyond the Bealach an Sgairne. 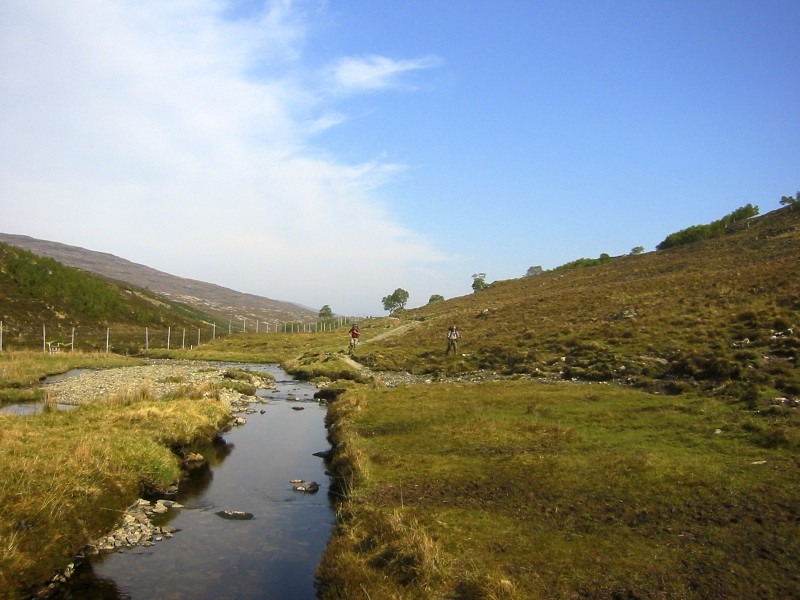 It was a long slog up to the bealach which was not helped by seeing the excellent path on the other side of the river. 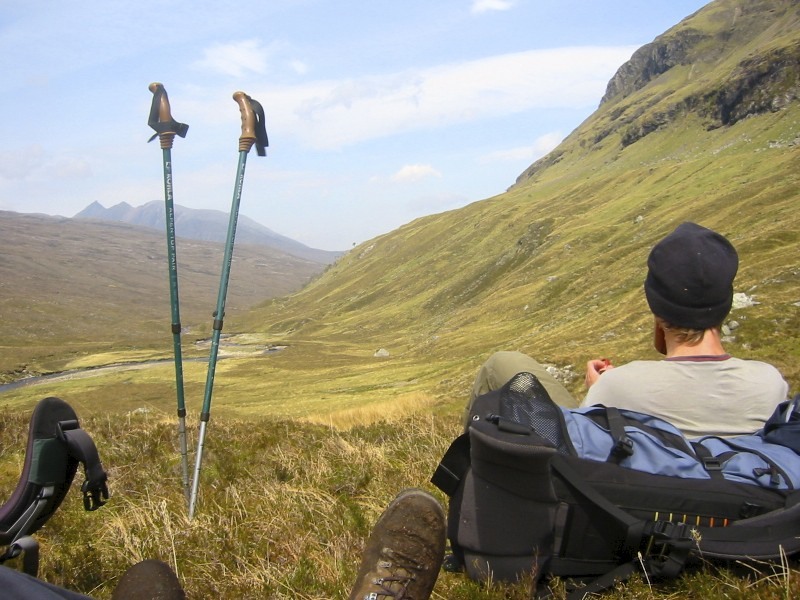 We were all worn out by now and despite resting at the top of the bealach we were once again spread out at the bottom. Rob in front, kept going, determined to reach the youth hostel. Finally with the last of the light the youth hostel came into view, Stuart who had been complaining for miles about being tired took off like an express train. He reached the youth hostel long before the rest of us. It was pretty full due to a party undertaking repair work on the paths, but we bagged the last remaining berths. We arrived to find the remains of a very large bowl of pasta, which the occupants of the hostel didn’t want to finish. Needless to say we devoured it. Jim appeared with a can of Tennants, his face beaming. The hostel had a large stash of lager and he was as happy as Larry. Not many were smiling the following morning as Jim kept virtually everyone awake with his loud snoring. I of course having travelled with him for many years, took out my ear plugs and slept through the lot. 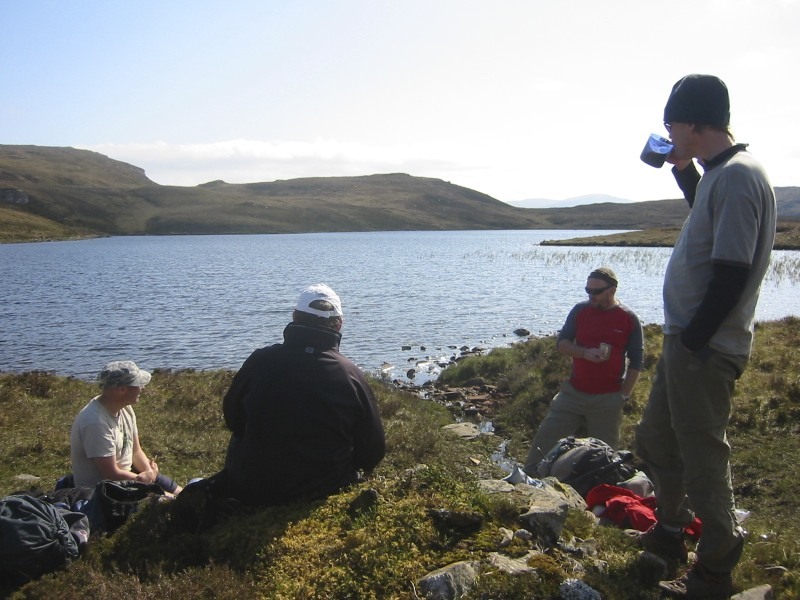 Several munro baggers were amazed in the morning to see the sight of Jim drinking Tennants for breakfast. The rule it seems is to carry out whatever you have drunk. I had no idea how many he and Simon had consumed. Stuart had eaten and gone to bed, Rob and myself had one can each. That morning Jim carried out twenty-one tins. The hostel manager had a wry smile on her face when we left, we were sure Jim had something to do with that. Indeed he had but not in the way we were thinking! Note the carrier bags full of crushed Tennants tins and why is she smiling? 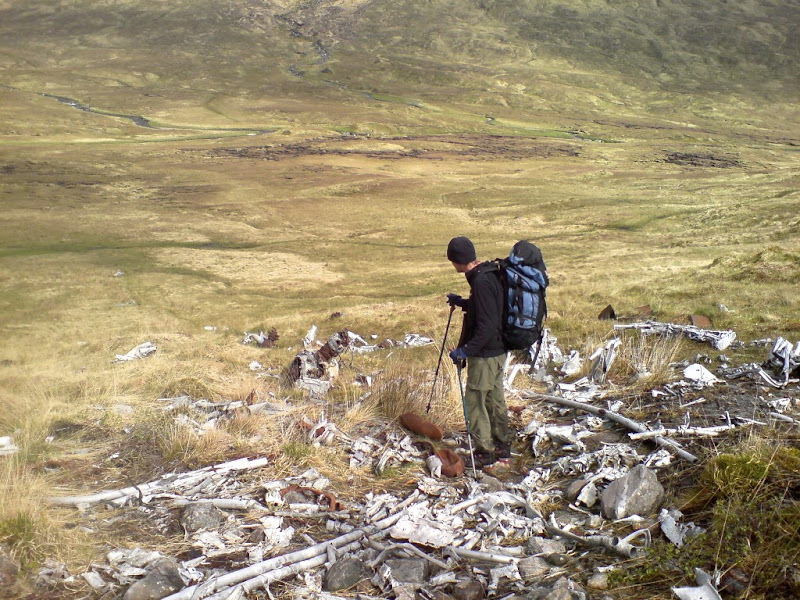 The walk out here is fairly easy; we passed the site of the crashed Wellington Bomber and took some photos. Its boggy most of the way, but we made good time and reached the Inn just in time for lunch. The mood had now improved immensely and we made the most of the facilities. We had another food drop, which we collected. Everyone was pretty well behaved that night and went to bed early, as they were all knackered. 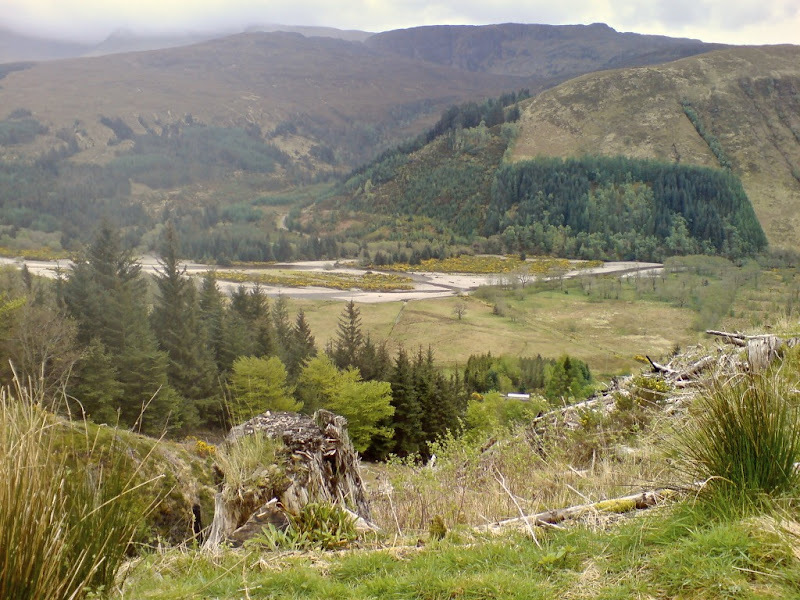 The plan was to cross over to Glen Loyne skirting Creag a Mhaim on the track and then cross the river Loyne, pass east Glenquoich forest and onto the road in Glen Garry. 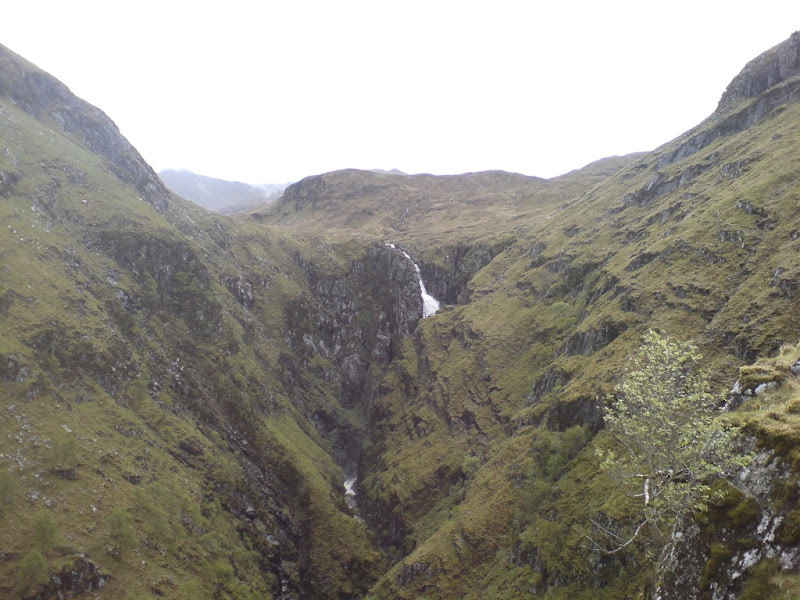 Somehow we managed to take the path up Creag a Mhaim almost bagging the munro before realizing our mistake. We dropped back down to the river, which was easy to cross. 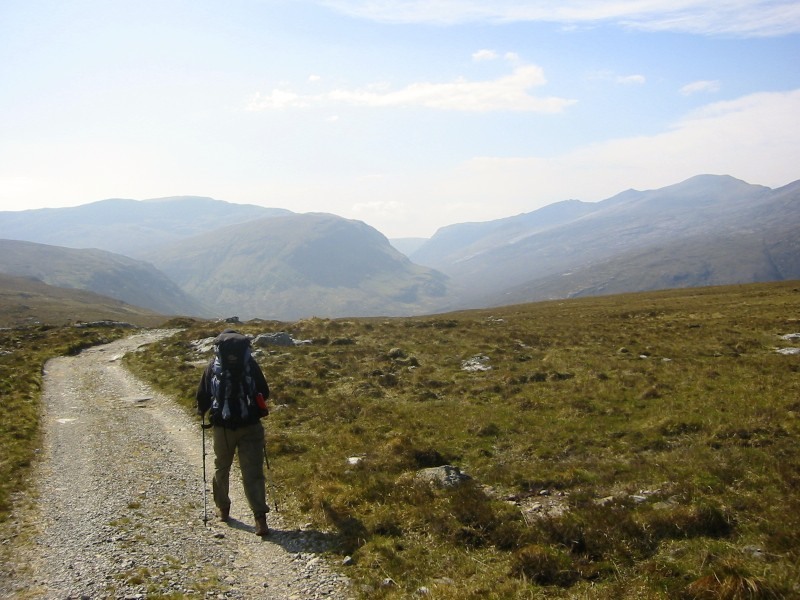 The walk into Glen Garry was straightforward but by the time we got there none of us felt like hiking up to the bealach below Gheal Charn where we planned to camp. Stuart having seen the Tomdoun hotel on the map rang them up and booked us in. It was a fair old hike to get there but well worth it. That night really was one to remember. 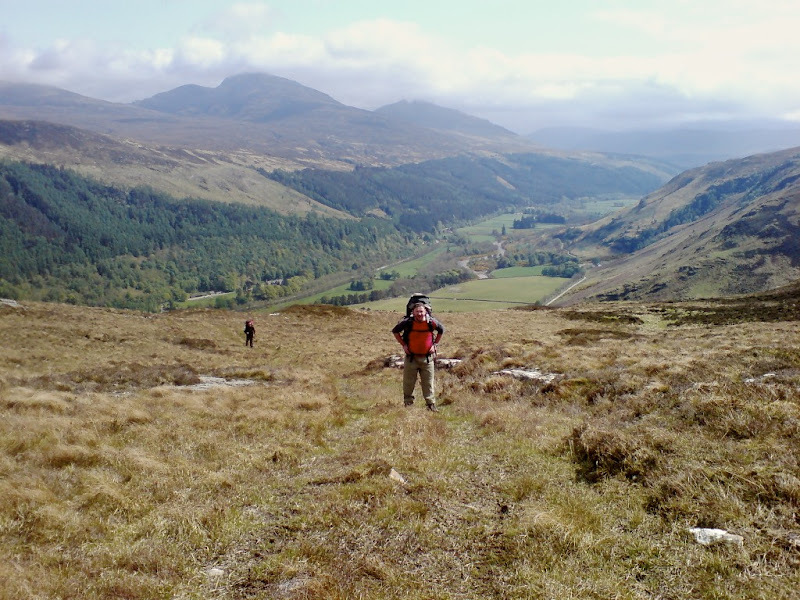 There was a hiker from Belgium there who was a right laugh, especially when he told us very solemnly that he was sh*t, we insisted he wasn’t. He wasn’t sh*t he was a decent bloke. No, no I am sh*t he said, then he realized he had used the wrong word, he had meant to say shy. Still makes me laugh now that one. 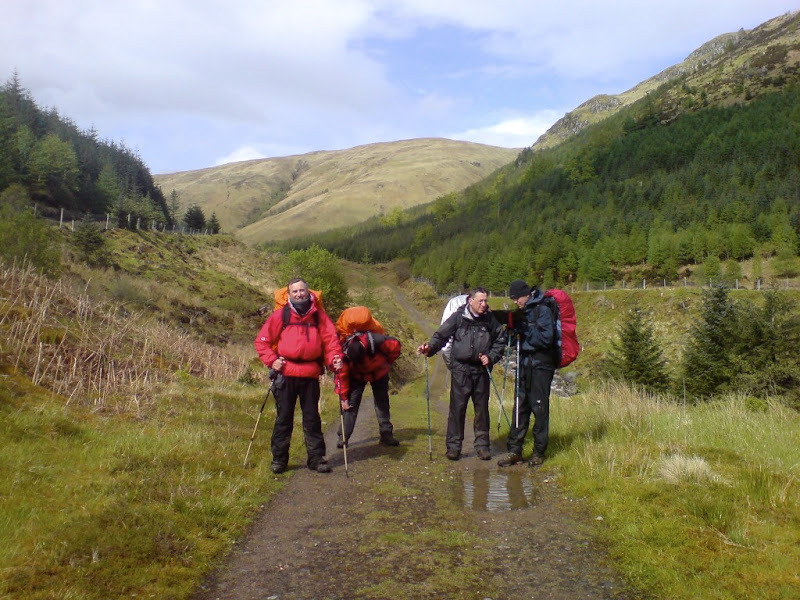 There were some lightweight hikers on a coast to coast route who were telling Stuart how a proper long distance walk should be done. 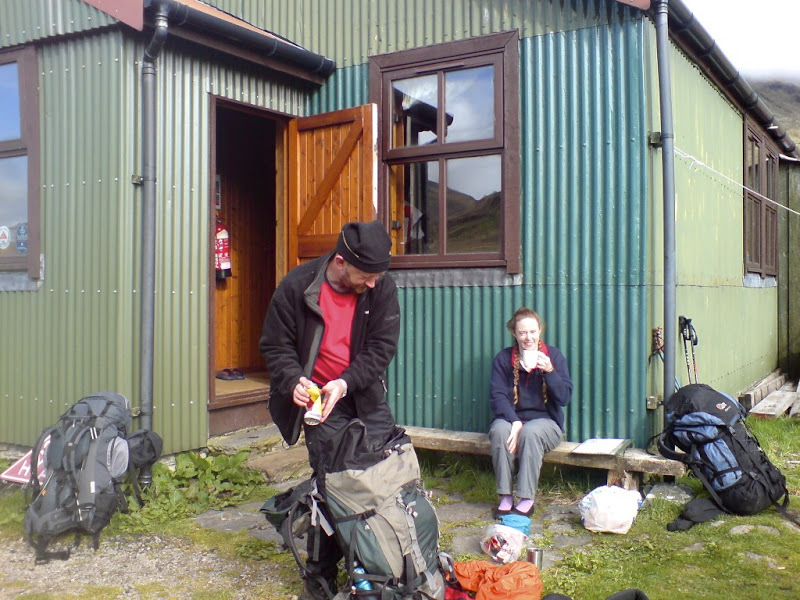 Why didn’t we have bothy bags and a 20p piece for emergencies Stuart asked? Well its because we’ve got a satellite phone and tents Stuart. Jim and Simon got extremely drunk. Jim had worked out Simon’s drunken gesticulations and was able to interpret Guinness and or lager. The pair of them insisted on buying everyone else in the place a drink, luckily it was fairly empty. The bill in the morning was still going to be horrendous. The lightweight hikers, in more than one way it turned out, mistakenly paid our bill. They were half way up the road before they realized. I noted it straight away and by the time they returned we had worked it out with the hotel owner. Sure enough it was a big one, Jim and Simon had consumed a phenomenal amount of alcohol. 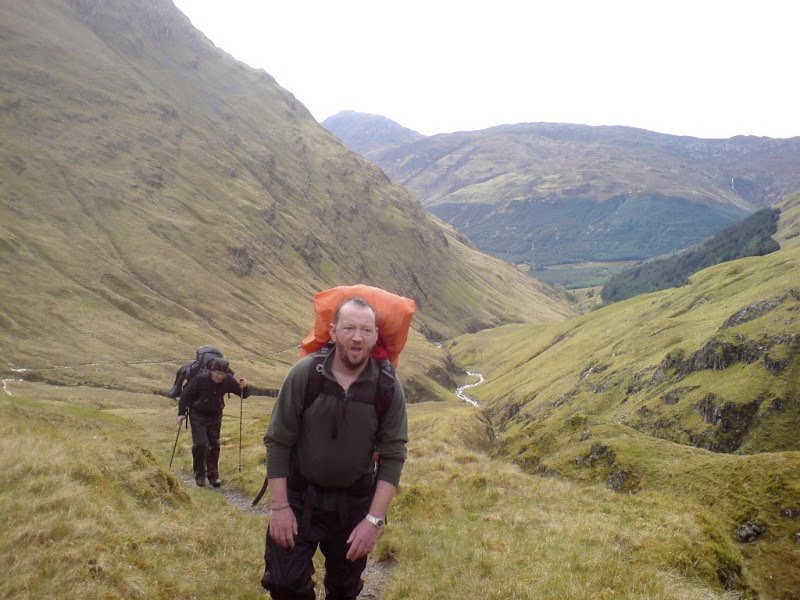 What’s more the pair of them were ready and raring to go, Stuart was still extolling the merits of bothy bags and 20p’s. 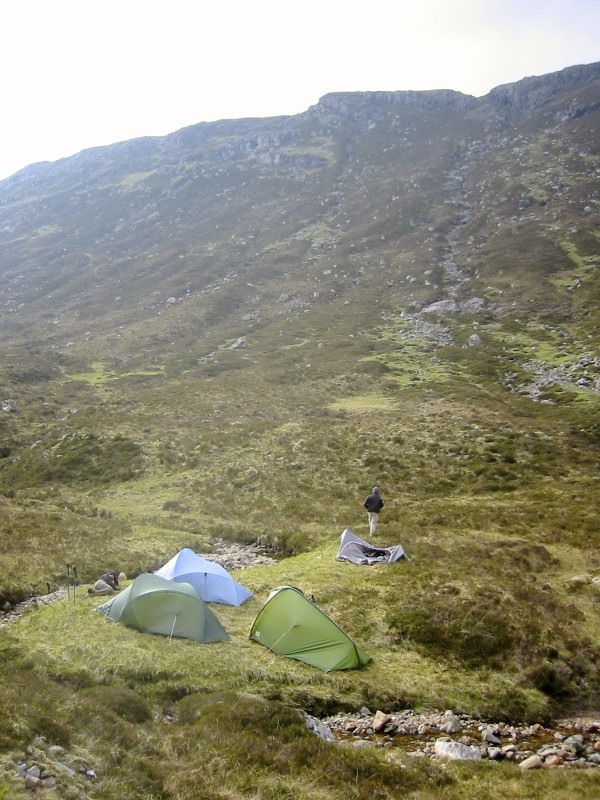 I pointed out if those hikers were so well organized how come they couldn’t work out their hotel bill, 21 pints of Guinness, 15 pints of lager and a pint of cider (who drank that?) should have been a giveaway. 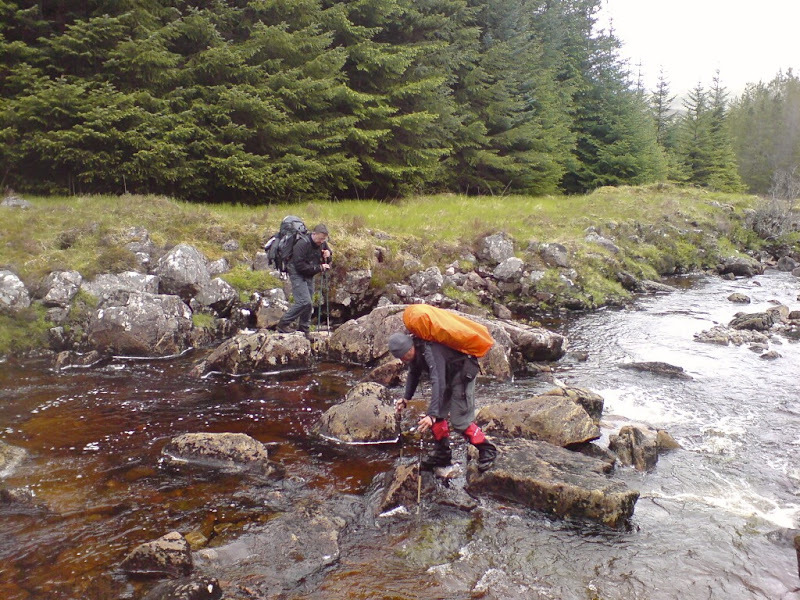 We crossed the river Garry and slogged through the pinewoods. Somehow we lost Simon. Once more Rob volunteered and went to find him. This took a good hour, maybe radios were needed. 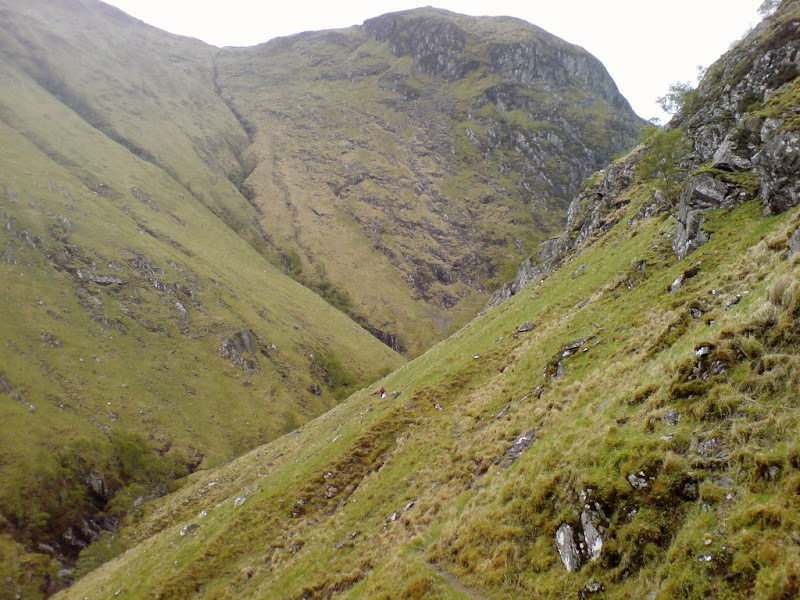 We were headed up past Bad an t-Seobhaig and the route was a little tricky to find in the woods. We crossed several burns, some had bridges but none were safe enough to cross. 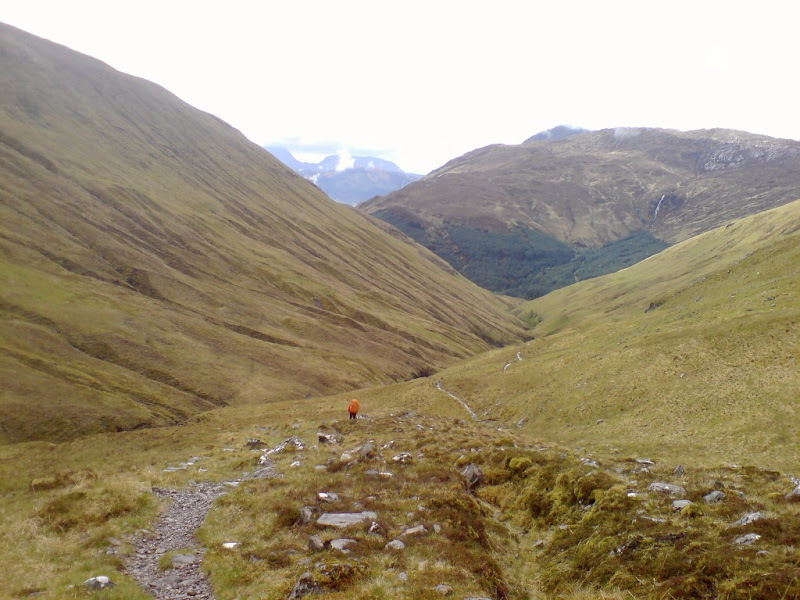 One in particular over the Alt Lon Ghlas Bheinn was completely rotten. We finally made it up to the bealach Carn na h-Urchair, the final mile of so over pathless heather of the energy sapping variety. 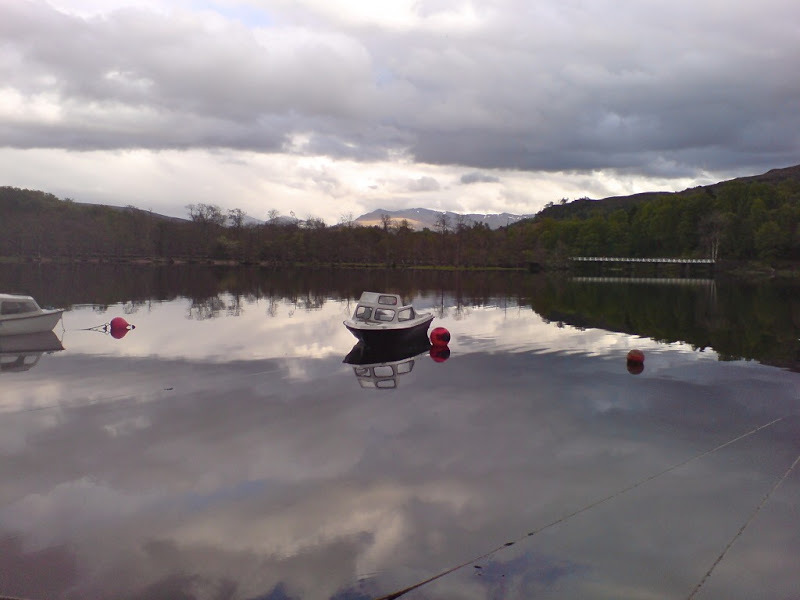 No wind on Loch Arkaig, midge warning! 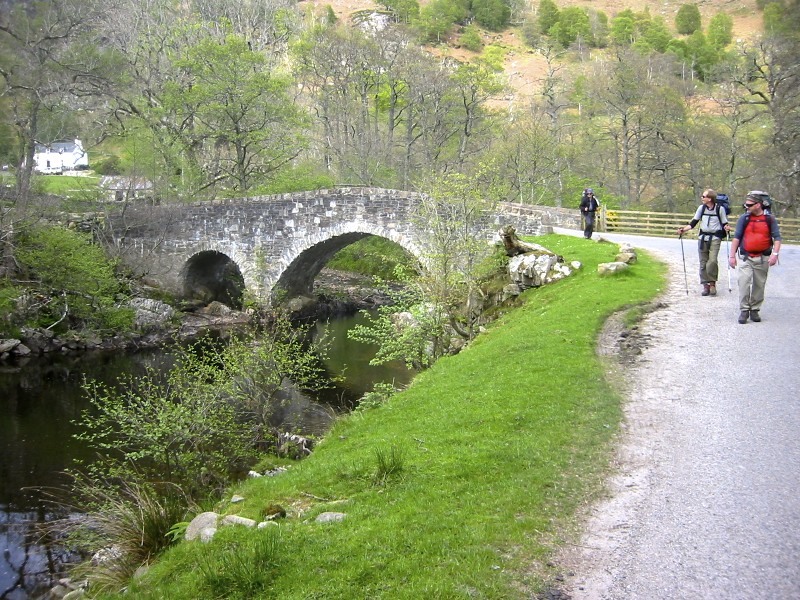 We reached the Great Glen Way at Achnacarry. Having already done this several years before and because of the rain, we decided to call a taxi to take us into Fort William. 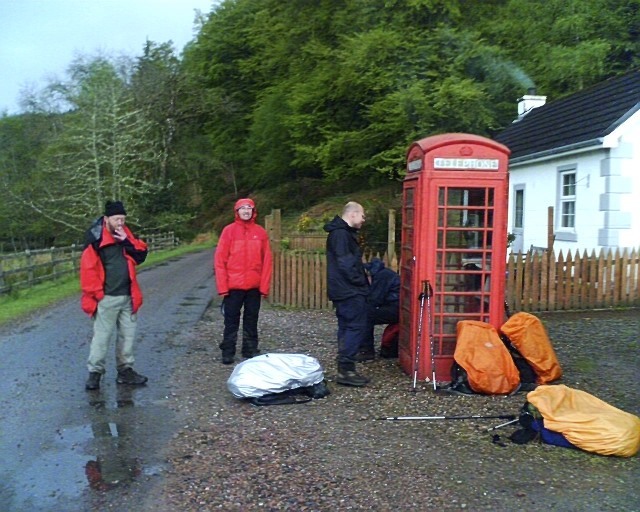 There is a phone box at Achnacacarry, did anyone have a 20p piece? So that was job done, or almost. We wanted to try an alternative route and did so the following year. Stuart had had enough however and said he would pass that one over. He was older than the rest of us and he found the pace too harsh. He does a lot of hill walking, but I think the drinking/walking combination was the main problem. Know your limit is my motto on that one.